Make portion control a breeze with our collection of portion spoons! 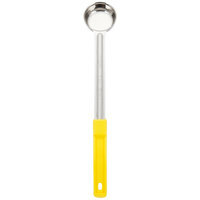 This 1 oz., solid, yellow portion spoon is one-piece and can be used to measure food for both wet and dry portion control. It has a color-coded handle for easy identification and kitchen organization! The colored handle eliminates the stress over spending too much time searching for the right spoon. We use the 1 oz. One-Piece Solid Portion Spoon for cheese portion control on our sandwich line. Works very well and it portions the perfect amount. Handle was longer than expected. Looks smaller in the picture. Easy to use and easy to clean. Could be a little sturdier. I still recomend it! These are used to serve honey ginger tea and hibeybcitron tea into to go cups. The size is the perfect serving size for our teas. This portion spoon is perfect for toppings to salads, burritos, etc. The size is perfect for just a little bit of an ingredient to be used. Love the yellow handle. The 1 oz. portion spoon maintains those liquids that i may want to add on to my 3 oz. portions. For instance if I am eating mashed potatoes, and i want to add gravy on top, the 1 oz. spoon serves that purpose. This is a great spoon for doing portion control during bot serving and prep. It measures the perfect amount of food every time, controlling costs for the business. Sturdy and nice looking, great price too! Very reasonably priced and they seem to be pretty good quality that will last. This small size is perfect for portioning out higher calorie (or expensive!) items on our salad bar. This spoon is a portion control dream for non liquid add in such as slippery M & M's , I really can't believe that it took me so long to grab one of these. Otherwise known as “Spoodles”. Definite must have in the kitchen. Portion control and many other uses. We have them in the big prep table. Used everyday. I have used these portion control spoons for both red Chile and green Chile. The one once size is perfect for salsa as well. Recomend. Nice portion spoon. I appreciate the variation of colors of handles, and also the clear size markings. Perfect for dry scooping dry goods or sauces. I purchased the 1 oz. One-Piece Solid Portion Spoon for home use but its definitely restaurant quality. It works great for serving small portions. Great value! We love this spoodle for baking. It's a good measure for our cookies and easy to level off. The shallow, rounded edge make it easy to clean and scoop out of. this is a very handy one ounce portion spoon. i keep this close at hand in the kitchen whenever i'm preparing a meal. it really helps reduce waste. I ordered these in all of the available sizes. They are good for even food portions, baking evenly, and etc. They are long ones but easy to handle. what a perfect size...one oz solid portion spoon. Perfect for sauces, spices or any other ingredients one needs to quickly measure...and the best thing is that the handle is long and is color coated for portion size. I purchased the complete set and I zip along knowing in advance the size of the portion spoon. Great price, Good quality. Smaller size is nice for more expensive ingredients. Like their 2 oz counterparts, very sturdy and tough. Use them every day multiple times and couldn't be happier. The spoons did its job! The toppings we needed to scoop had a lot of juice so we ultimately ended up purchasing the portion spoons with holes. But these spoons are made very well and are very durable. They're also dishwasher safe! The 1oz. Solid portion spoon is my Wonder tool!! One of the family favorites is Mac N Cheese bites well that's a lot of work!! This mini wonder tool makes it easy to serve that perfect mini portion...In the process of purchasing more spoons...Also PERFECT for gravy! These are great tool to control your food cost. We have saved on our cost by using these spoons. They look nice and I do recommend them. The more I use these portion spoons the more I like them, The 1 oz. One-Piece Solid Portion Spoon doubles as a convenient measuring spoon, which is how I use it. This spoon works great, is very durable and is very easy to clean. Product scoops out cleanly. I use it to portion out sour cream for nachos and it does the job. You can use the 1 oz. One-Piece Solid Portion Spoon to help make tamales done faster by using the already portioned 1 oz spoon and put on the masa. Great if you like some of the liquid with the meat mixture. I use this scoop for portioning out mixed berries in my yogurt Parfaits. Very pleased with its sturdy structure and it has a convenient hook for easy storage. Definitely sturdy, but at 1 oz, it's definitely small! Great if you need to portion gorgonzola for a salad, or for putting pizza sauce on a kid's size pizza - about 6". I ordered these to reach into gallon jugs of mayonaise and other condiments. They should do the job without me getting my hands messy while trying to empty the last of the contents. Good, utilitarian serving spoon. It was flatter than I imagined it would be, but that seems to make it a little more flexible in the kitchen, rather than a rounded spoon or scoop. Good for portioning sauces and powders. 1 oz one-piece solid portion, like the color of it it is easy to grip and serve with. it has quality. and at a low cost. This one ounce portion spoon is good for gravy or kids sized portions. Not much use for an adult plate though. The price on them are great. these are great tool to control your food cost. we have saved on our cost by using these spoons. they look fancy and do recommend them.